Progress on Long Steps, work on the ship and grumbles about the weather of late. 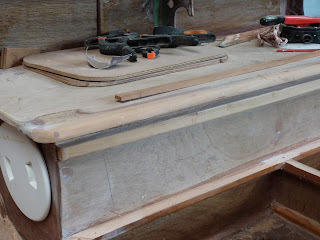 In the last few days I’ve had time to do a bit of work up there in the shed , Long Steps is all planked up now, if you were to toss her in the tide she’d not only float ( being made of wood) she’d float upright and dry inside, and even look like a boat. Woohoo! That’s a milestone indeed! All planked up, she's looking like a real boat now. 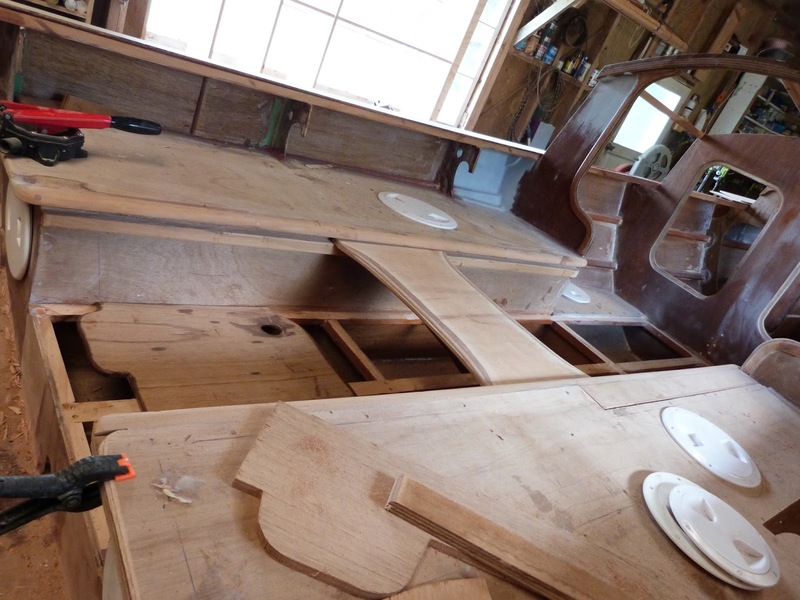 Lots still to do but its nice to be working on a "boat" rather than an odd looking 3 D jigsaw. An aside here, we’re a metric country, kilometres is how we measure distance but the word “milestone” has stayed in our lexicon, that’s interesting. So I have “ a boat”. Still lots to do, but we’re into the more fiddly parts now. I’ve made the rowing seat, fitted the seat rails and the side seat nose pieces with the soft edge radius that is so helpful to the comfort of the crew. 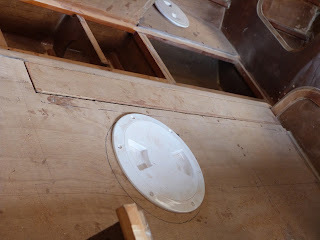 I’ve made a lot of little bits and pieces, fillers and doublers, filled a heap of screw holes with epoxy, coated a lot of the interior and am well along with roughing out out all the pieces for foredeck, side and after decks. 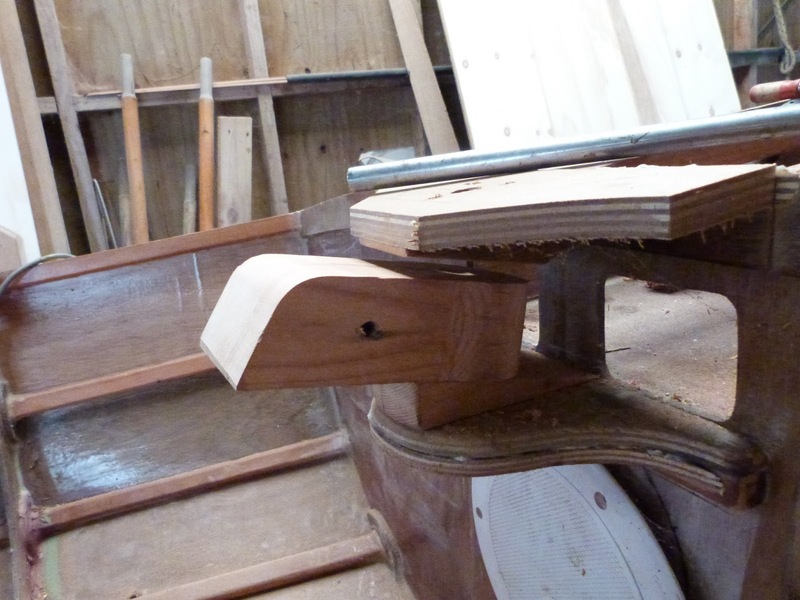 Rowing seat rail and the edge nosing for the side tank seats, note the gentle radius which reduces the discomfort that happens when ones thighs are creased over a sharp cornered edge. I made up the rowing seat yesterday, it can be slid along those rails to position it conveniently for sail or rowing, or sleeping but cant lift out, it has to come out at the after end should it need to be removed. Its 18mm plywood, plenty strong enough to jump on if I'm getting in off a high dock. The "off"centreboard case cap, it hooks under the fixed part of the cap at the after end and will have a tower bolt at the forward end to retain it, this gives access to the lifting line and pulley. Before I fit those I have to sit down and design the circuitry for the electrical system. That has to power an SSB/VHF radio, navigation and anchor lights, cabin light, GPS / Chart plotter and spotlight. It also has to provide USB points for charging the cellphone and laptop. Yes there will be a battery, a 140 Amp Hour deep cycle marine battery that weighs around 30 kg, that’s 66 lbs, a useful addition to the ballast! It a biggie because there is the potential for quite a high electrical load on it, and the solar panels may not be enough to keep up with the use if I’m trapped by less than clement weather. The water ballast tank by the way holds 225 lbs of water. I'm expecting that plus the battery to keep her on her feet when its blowing a bit. The battery box by the way is a project that I’ve been avoiding, yes I’ll have to do it soon, certainly before the lid goes on the cuddy, building and securing it through the hatch wouldn't be fun. The wiring too, needs to go in before I put the side decks on, much of it will run along inside the gunwale out of any potential harms way, but that’s difficult to access with the side decks and cockpit coaming on, so, like the battery box, its time to get that done. The tiller pivot layout has been giving my thinker a bit of exercise, and I attacked that today. There are two issues, one being that its to be remote from the rudder and connected by pushrods, that takes it around the mizzen and forward to where the crew weight needs to be, leaving the lazarette ( the area under the after deck) as bouyancy and storage, about 0.6 of a cubic metre, in imperial measurements that’s 1,2220 lbs of bouyancy. This boat by the way has over 2 tons of built in bouyancy distributed between 11 compartments, even with several holed she’d float high enough to support her crew and still be stable enough to make progress. The drill all set up with the jig to keep the angle right, I used a set square for the other axis. Visible too are the blocks which give faces at right angles to the pivot pin between which the tiller head will swing. Yes the drill is a Ryobi, no I don't like it much but I own two of their batteries plus charger and the bare drill was really cheap. Here's the tiller head resting in place, there will be an aluminum plate bellcrank screwed to the top of that block, and the pushrods go back through the holes in that bulkhead, along a "tunnel" to another bellcrank on the top of the rudder head. 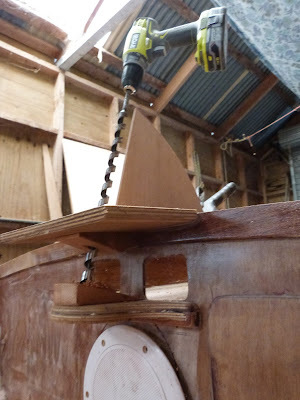 But back to the rudder and tiller, with the tiller connected to the rudder head by solid pushrods its important to have the tiller pivot axis and the rudder head pivot axis the same so the distance between the bellcranks on each, remains the same as the assembly turns. So there was a bit of fiddling, some wedge shaped pieces, a jig to set the angle of the drill and some wild guesswork with the “eyecrometer” to get that done. There is a hole right through there which will take the pivot pin, a chunk of 19mm ( actually ¾ od) stainless tube out of my collection of “hey that might be useful someday) items. So its near done, I’ve some 6mm aly plate from which to make the bellcranks, a piece of scrap aly channel to make the hinge for the tiller so it can be lifted up out of the way when needed, and plenty to do tomorrow. Meanwhile, New Zealand is feeling the effects of global warming, we’d normally get the tail end of one tropical cyclone every 5 years or so, this summer we’ve had three. It was the same last summer. Sea temperatures are so much higher than normal that we’ve changes in our local fish species evident, different types of seaweed beginning to flourish where its not been seen before, and RAIN. We’ve had the hottest summer on record, and the wettest, which has been a pain in the very low back! Ah well, I did get out sailing some, plus Denny and I took the ship away for a short cruise, and yes it darn near blew our socks of so the passages were made very late at night to try and catch the calm of the night time. Fun though, we enjoyed it. In between all that I’ve repainted Sei, she’s now a rich navy blue with red trim, have sanded off and painted quite a bit of my ship, and at 40 ft x 12 ft and two decks high there is a lot of her, and redone a lot of the electrical system. All the “house battery” powered circuits went dead, and when I looked in behind the wheel to try and find the problem, the rats nest of wiring in there was beyond my ability to figure out, even after two full days with the multi metre it was still a shake of the head. So, off to the wholesalers and back with a big roll of wiring and two new bus bars and some switches, and I’ve rewired all of those circuits all the way from the battery to the action. Along the way replacing several panels of plywood where I had to smash the originals to get into the spaces where the wiring was. Ah well, the new panels are removeable. Autumn now, its blowing like stink out there, forecast for rain but its not cold. I’m hoping to take the rowing boat up the river at daybreak tomorrow, Indy the little terrier and I will sit up there under the trees’ listen to the birdsong as they wake up, and watch the sun come up.